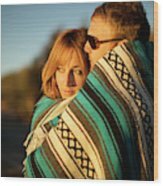 There are no comments for Couple Wraps Themselves In A Blue. Click here to post the first comment. Couple wraps themselves in a blue and white blanket and watch the sunset in San Diego, CA.